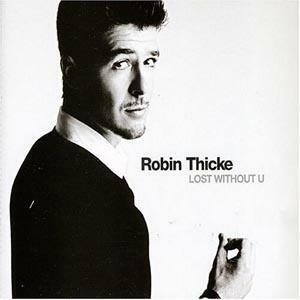 Think that Robin Thicke music is only about "Lost Without U"? Think again? This fantastic vocalist has actually been producing great songs since way back in 2000. He's enjoyed a lot more commercial success lately, and we can only believe that this neo soul and pop music artist will only get more popular with future albums. Robin Thicke was born on March 10, 1977 as Robin Charles Thicke. His last name probably sounds very familiar, because Robin is the son of Alan Thicke, the Canadian actor best known for his role on Growing Pains. When Robin first hit the music scene in 2000, he simply went by his last name: Thicke. His debut album, Cherry Blue Skies (released in 2002) was very soulful, but enjoyed very limited success. While working on songs of his own, Robin Thicke was also heavily involved in writing a series of tracks and music lyrics for bigger names in the R&B genre. Among the names that are connected to Robin Thicke's work are Christina Aguilera, Usher, Michael Jackson, Mya, and Brandy. These soulful ballads were instant hits for their respective artists. Robin Thicke has a fairly unique appeal in the industry for a number of reasons. Although he has never explicitly used it to his advantage, being the son of Alan Thicke surely got Robin's foot in a few doors that he may not have otherwise been able to do. Moreover, you'll notice that Robin Thicke's beautiful voice has been featured on MTV and BET (Black Entertainment Television) alike, right alongside big names like T.I. and Rihanna. His voice is very unique. Other male artists may focus on having more masculine-sounding voices, but Robin Thicke's singing voice is decidedly high pitched. This is particularly apparent in his hit single, "Lost Without U." Robin Thicke music is officially categorized as contemporary R&B, playing alongside Christina Aguilera, Mariah Carey, Ne-Yo, Alicia Keys, and Justin Timberlake. In this way, some may say that this genre of music is slightly different than "pop," because of the soulful and emotional ballads found within. Thicke's discography to date consists of three albums with one more planned for later in 2007. In 2002, he released Cherry Blue Skies, following it up with A Beautiful World in 2003. He then went in a relative hiatus for a few years as he worked primarily on writing songs for other artists, as described above, before releasing his most recent album, The Evolution of Robin Thicke. It is on this album that you will find "Lost Without U." The upcoming 2007 album has not yet been named, nor has it received an official release date. As such, it is very possible that it could be pushed to 2008. In addition to "Lost Without U," Robin has also released "Can U Believe" as a single in 2007. Prior to this, he had some radio play from "When I Get You Alone," "Brand New Jones," and "Wanna Love U Girl" (featuring Pharrell). Never heard of these other songs? I don't blame you. Robin didn't receive much critical or popular acclaim until this year. In fact, it was only in 2007 that he was nominated for Best Male R&B Artist Award and Viewers' Choice Award at the BET Awards, as well as being nominated for Best R&B/Soul Album, Male at the Soul Train Awards. Not sold on Robin Thicke music? Well, there are a number of places on the Internet where you can sample his songs for free. At Amazon.com, you have the opportunity to listen to short song snippets. These are very short and cannot be downloaded for offline play, but they give you a real indication of what these songs sound like. You can buy his music online as well. Rhapsody has a page dedicated to Robin Thicke. They describe his song stylings as being "strong, if slightly sappy," but there's no denying his popularity and talent. Play samples from his album via the online Rhapsody music player. Yahoo! Music also has a web page for Robin Thicke, providing you with links so you can buy his albums, watch his music videos, and listen to 30-second song snippets. At Yahoo!, you can find music lyrics to "Everything I Can't Have" as well.